Although diversity provides a greater pool of knowledge and perspectives, teams often do not realize the potential offered by these additional informational resources. In this study, we develop a new model seeking to explain when and how teams that are diverse in terms of educational background utilize the afforded informational variety by engaging in deeper elaboration of task-relevant information. We found that collective team identification moderated the relationship between educational team diversity and elaboration of task-relevant information, such that under high (low) levels of team identification, educational diversity was positively (negatively) related to information elaboration. As expected, this moderating effect was shown to be mediated simultaneously through two different types of perceived team diversity. 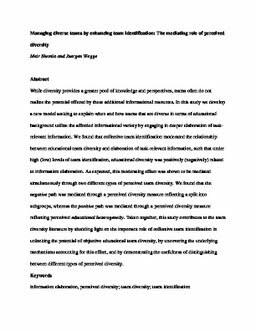 We found that the negative path was mediated through a perceived diversity measure reflecting a split into subgroups, whereas the positive path was mediated through a perceived diversity measure reflecting perceived educational heterogeneity. Taken together, this study contributes to the team diversity literature by shedding light on the important role of collective team identification in unlocking the potential of objective educational team diversity, by uncovering the underlying mechanisms accounting for this effect, and by demonstrating the usefulness of distinguishing between different types of perceived diversity.